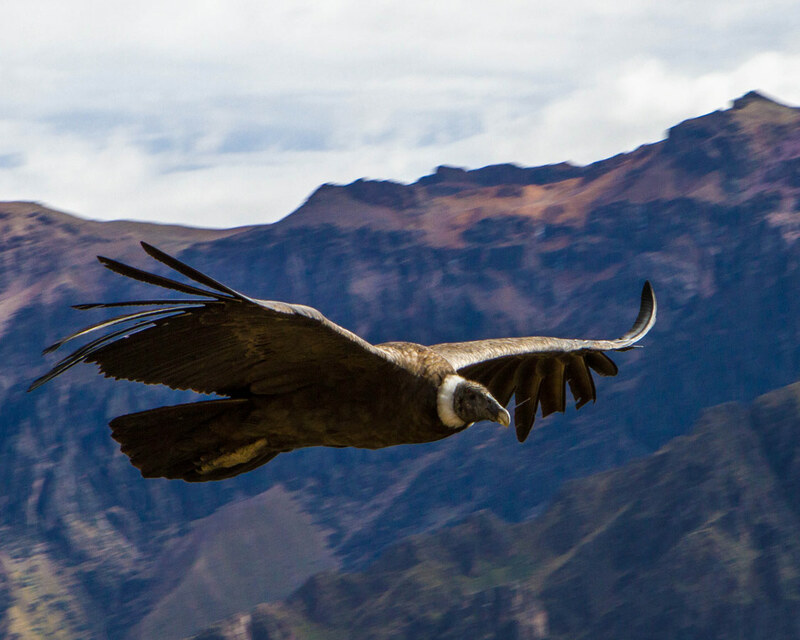 I have been fascinated by stories of the Andean Condor since the days in my childhood. I would spend hours watching documentaries about the conservation efforts for this once critically endangered species. 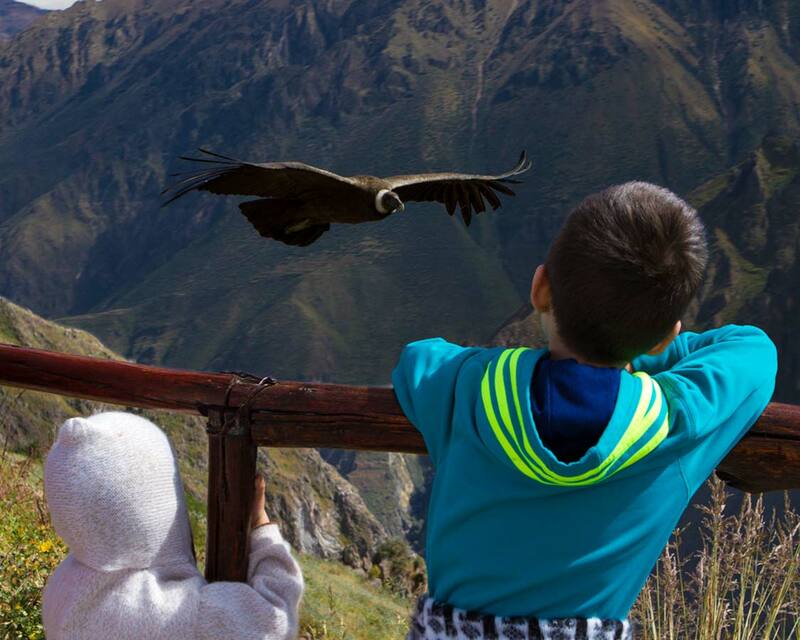 So during our two weeks in Peru I was very excited for a chance to head to the city of Chivas Peru to see the Andean Condors in Colca Canyon with kids! We were picked up from our hotel in Puno early in the morning for the day long journey to the town of Chivas Peru. Unlike our drive from Cusco to Puno, the drive fom Puno to Colca Canyon is usually only about 5-hours, we would be taking in a lot of sites on the way. The length of the drives in Peru no longer intimidated us after our 9-hour Cusco to Puno bus-trip to see Lake Titicaca. The boys were excited for the chance to see volcanoes, and Christina and I couldn’t wait for all the sites we would experience along the way. 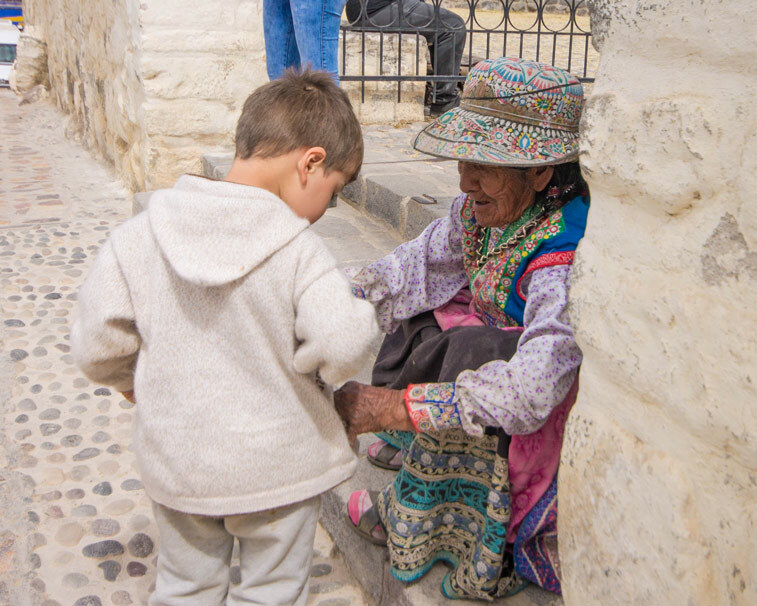 The route from Puno to Chivas and our Colca Canyon tour took us through the Andes mountains along high-mountain passes and vast plains filled with alpacas and llamas. During our visit, we made a few stops on the way that made this journey one of our favorite road trips in Peru. 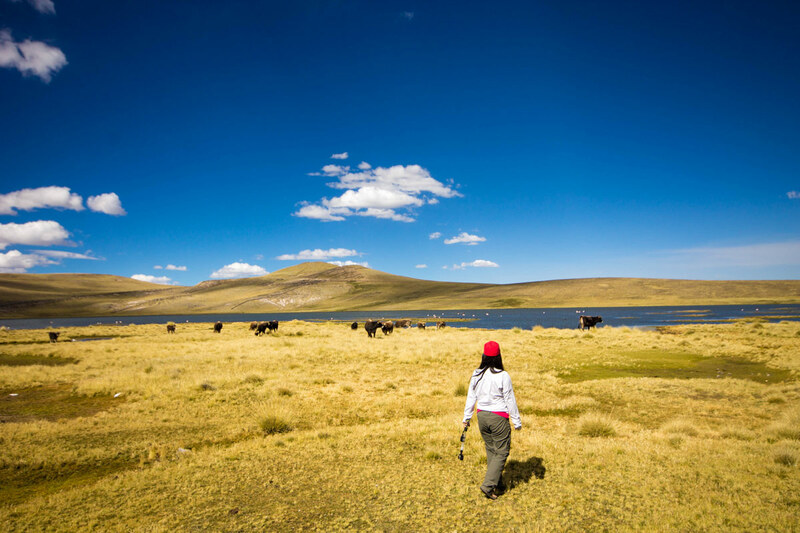 Our first stop on our road trip from Puno to Chivas was on the shores of Lake Umayo. 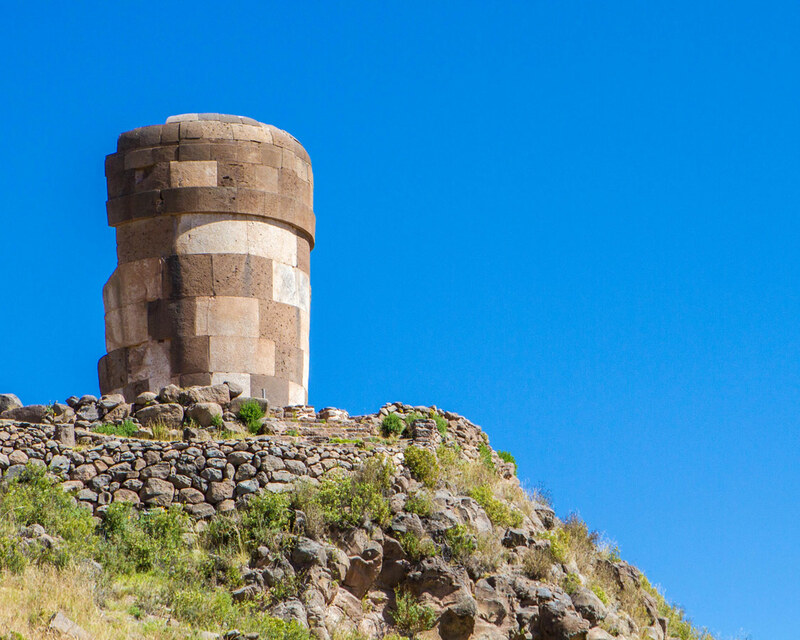 The town of Sillustani Peru is unique in the region for its stunning pre-Incan funerary towers. On a raised hill above this picturesque mountain lake is an archaeological site with impeccably precise tombs. These towers, called chullpas, were the burial sites for the Qulla people. Chullpas date back to 500-950 AD and housed groups of mummies within their walls. There is a secondary site off in the distance of smaller, white chullpas that was set aside specifically for the burial of children. 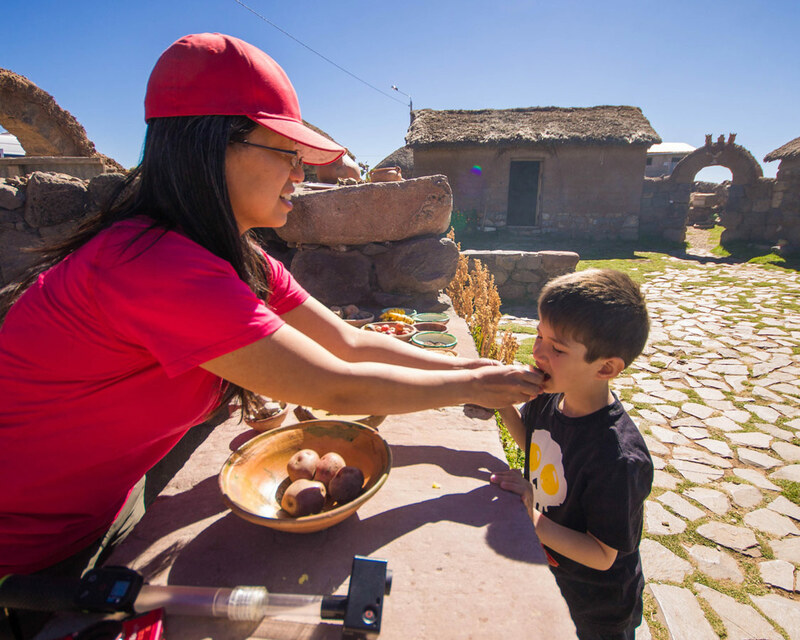 Besides these ruins in Peru, when you tour Sillustani you’ll find a small town and market at the entrance. And off the shores of Lake Umayo is an island that houses a vicunas sanctuary. 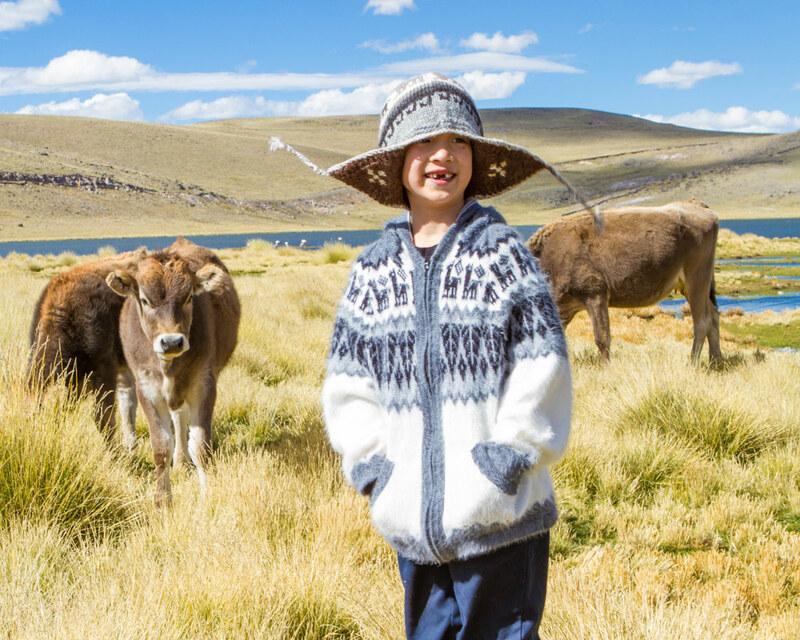 While visiting the chullpas can be done easily, you would need to sign up for a Sillustani tour in order to see the Vicunas. Sillustani is one of the unique Peru archaeological sites that we found during our travel to Peru. Our favorite stops on any trip involve getting a chance to meet local people and experience their unique ways of life. We had another of these experiences on our way to Colca Canyon Peru. We stopped at a small town where our driver had some friends and got to visit their home. And we also experienced some local remedies for C’s stomach trouble. Besides another chance to get close to llamas and alpacas (because that never gets old), we also watched first hand as our host made handicrafts and paintings. We learned about the local potato agriculture and tried a mixture of potato and clay. This is the mixture that cured C of his rumbly tummy that knocked him out during our visit to the Sacred Valley. 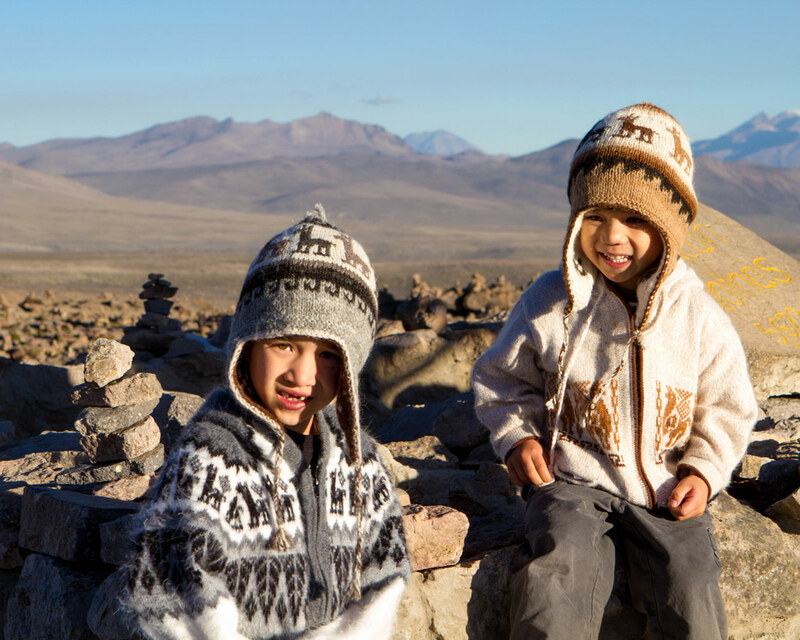 We picked up a couple of llama wool hats for the boys too that they rarely wanted to take off as you can see from the photos later in the article. Although the road trip from Puno to Colca Canyon was a long one, it never lacked views. From the mountains to the lakes to the wildlife, natural beauty in Peru was absolutely everywhere. The Andes in Peru has a large population of Chilean flamingos. Although Christina and I had had a chance to see these flamingos while we were in Chile, our boys had never seen them. So during our road trip from Puno to Colca Canyon, we kept our eyes glued to the lakes in order to catch a glimpse of these beautiful birds. D was the first to spot them. Just specs in the distance standing in an emerald lake. So we stopped the van and ran through a field full of cows (dodging cow patties along the way) and got as close as we could. This is when I learned that my telescopic camera lens was acting up. But we still got to see the Peruvian flamingos through our binoculars. Before our trip to see the Andean Condors in Colca Canyon with kids, we had no idea of the sheer number of volcanoes in Peru. 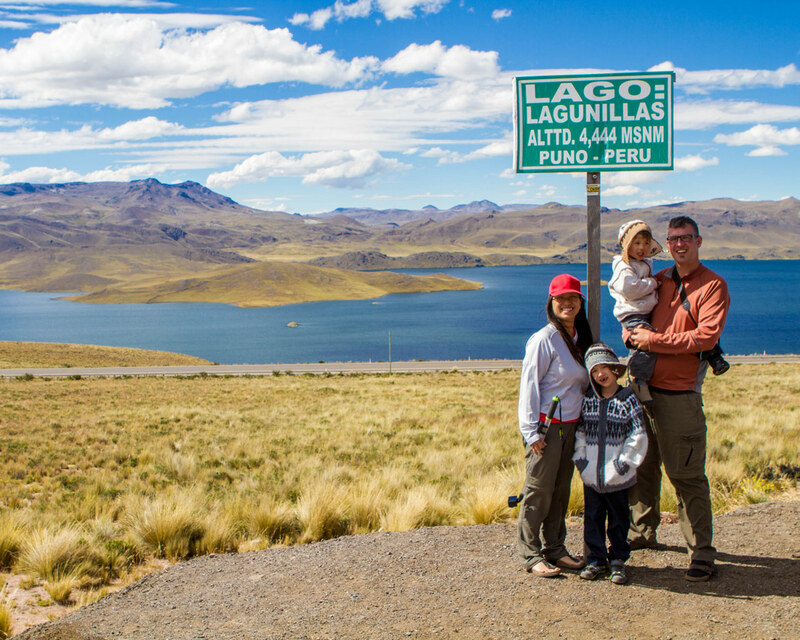 Our road trip took us the Patapampa Pass, dubbed the “highest pass in the Americas” at 4,910 m (16,109 ft). Near to that is a view that took our breath away. Mirador de los Andes is the highest viewpoint on the Pass, and looking out from the edge of the road, past the countless rock piles that visitors to the Pass have built, are no less than 5 volcanoes visible from this point. Due to all of our stops, we arrived late into Chivas Peru. We were all getting pretty tired and decided to skip the town and head straight to the hotel to check in. Hotel Colca Aranwa Valley del Colca is located past the city of Chivas, and is accessed via a winding cliffside road. The road is narrow and our big van was barely able fit down the path. We were starting to second guess our choice of accommodations until we actually saw it for ourselves. Hotel Colca Aranwa Valley del Colca is set up like a small village with many of the units being townhouse style multi-floor hotel rooms. The units were gorgeous, and the manicured grass and landscaped waterfalls flowing throughout the yard made it a perfect place to relax. 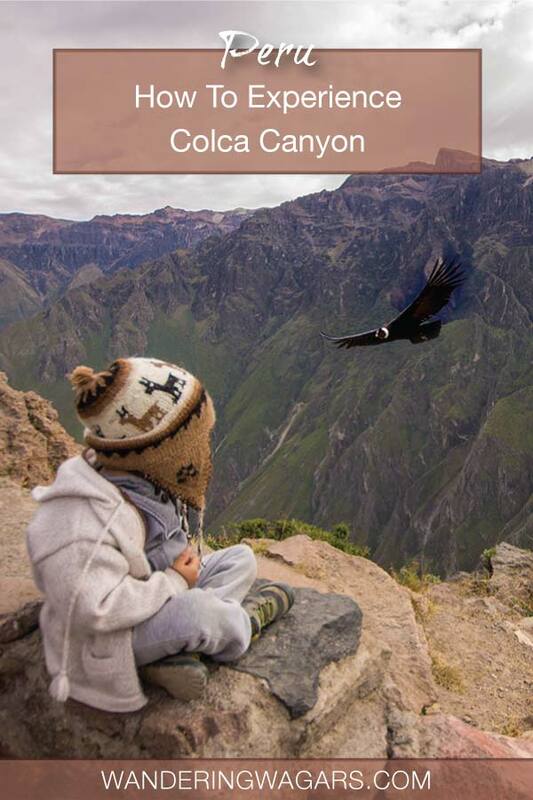 We awoke at 6 the next morning to get ready to see the Andean Condors in Colca Canyon with kids. With the sunlight already breaking through the trees, we looked up and saw a huge cloud of black smoke rising through the air. 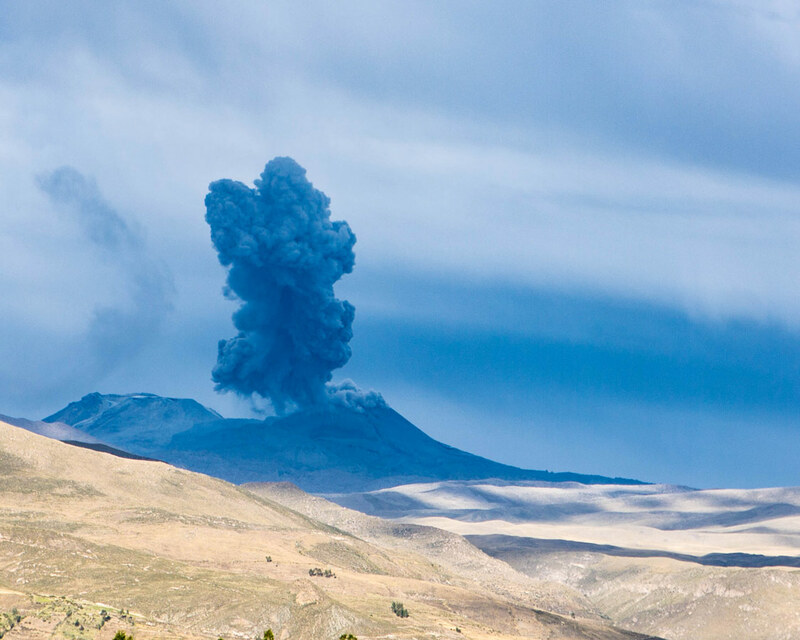 It turns out that one of the local volcanoes had blown its top. This had to be a sign of good things to come! We made our way through the down of Chivas Peru and began creeping up the canyon edge towards the top. As we climbed higher and higher the majesty of the area surrounding the Colca River became clear. Colca Canyon is one of the deepest canyons in the world. In fact, at its deepest, the Colca Canyon height is 3,270 meters (10,730 ft). Although the region we would be visiting was only about 1,200 m (3,937 ft), it was no less incredible. The Quechua speaking Cabanas people who live in the valley and the Amayra speaking Collaguas still farm the pre-Incan terraces in much the same way as has been done for hundreds of years. 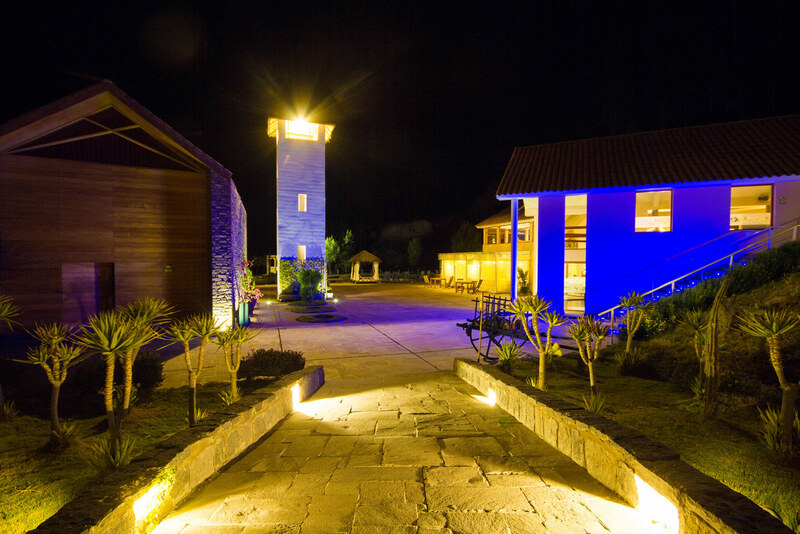 Even the massive boom of tourism to the region since the 1980s hasn’t led to a drastic change in lifestyle. 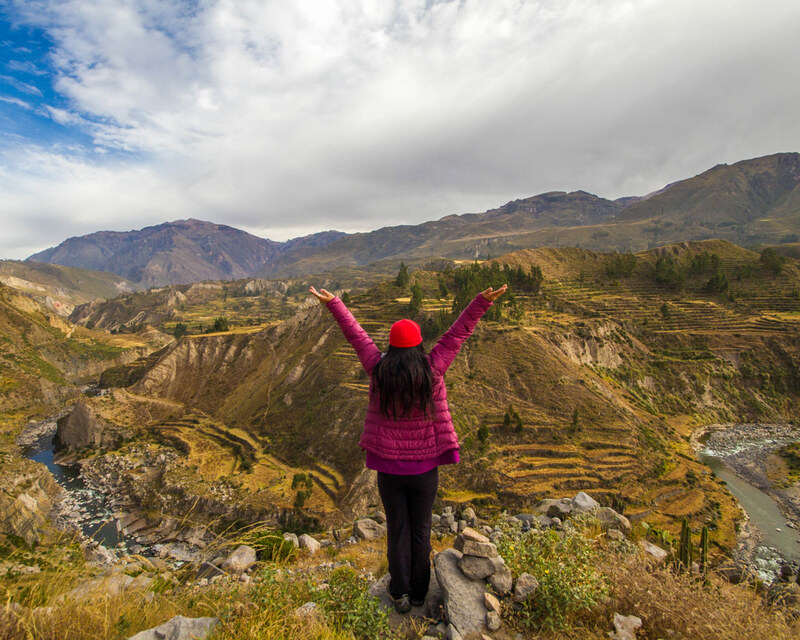 Colca Canyon is now the third most popular tourist attraction in Peru, seeing over 150,000 visitors come through every year! That’s not bad for a place that 50 years ago only had one road connecting it to the outside world. 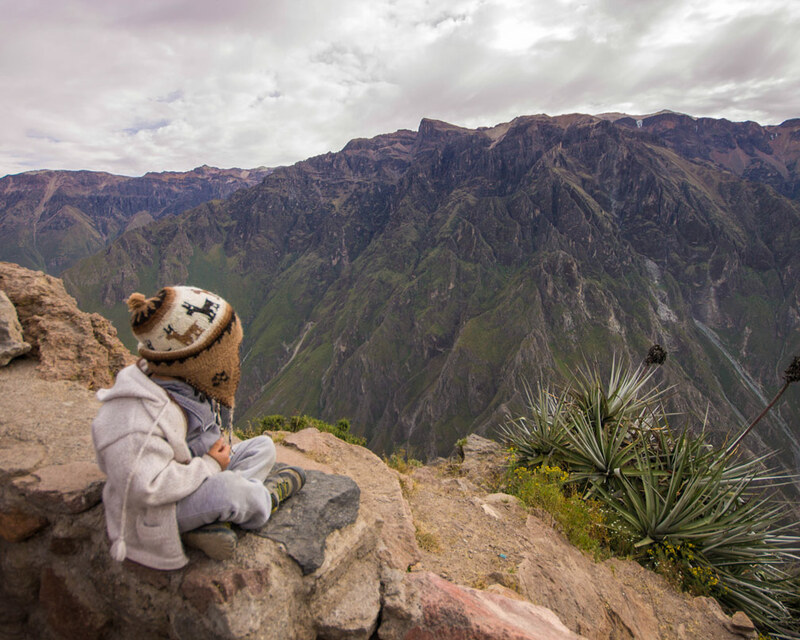 Colca Canyon is listed on many travel Peru tours, and with good reason. Colca Canyon is one of the top places to see in Peru. We finally arrived at Cruz del Condor Peru, which is a popular place for viewing the giant Condor of Colca Canyon. This well-maintained viewpoint stretches for several hundred meters along the rim of the canyon. It’s a benefit that the area is so large, as the crowds, even in the shoulder season were packed close in many places. Everyone was stretching out their arms and reaching cameras to the sky for a chance to view the Andean Condors flying effortlessly along the walls of Colca Canyon. We staked out a spot just down the hill from the main viewing area to avoid some of the crowds. And we sat, waiting to see if the world’s largest birds (by a combination of weight and wingspan) would put on a show. This Andean condor weight can reach 15 kg (33 lbs), and this large bird of the Andes can have a wingspan of over 3 meters (10 ft)! Pro-Tip: The walls of the canyon are incredibly steep. Make sure you keep children close by, as a slip could prove dangerous. We waited and waited, nearly 10 minutes, then 15. A few audible gasps from the crowd erupted, followed by sighs of disappointment as the birds failed to show. We decided to check out a higher viewpoint, closer to the parking lot. As we leaned out over the railing, straining for a look, a cry when out from C and he started jumping and pointing to a black and white speck that was growing closer and closer. “I see one!” he yelled. And then they started appearing, one after another, flying below the canyon rims, wingtips grazing the grassy walls. “Look at that Condor fly!” C cried excitedly. 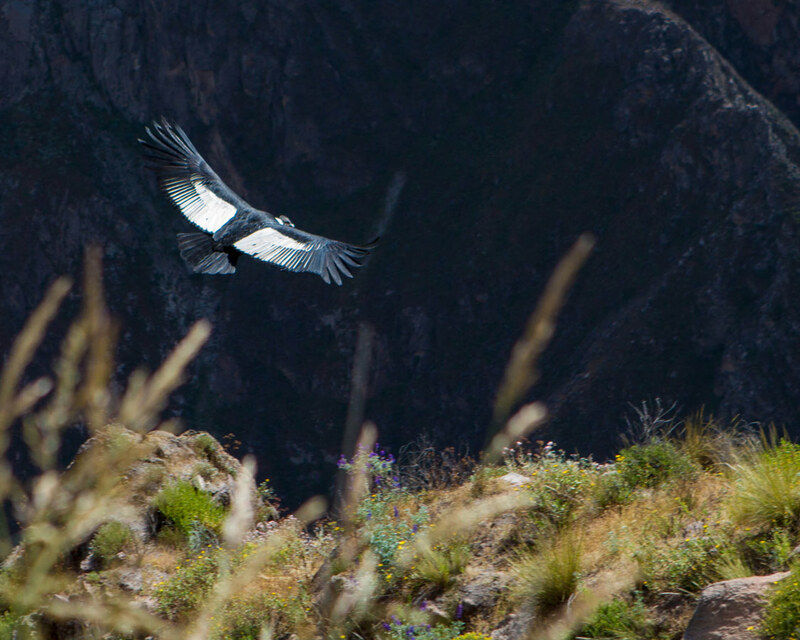 Thanks to Conservation Efforts, We Saw Andean Condors Everywhere! The boys ran along the path pointing out the Andean Condors in Colca Canyon as they appeared. One, two, ten, eleventeen (D is only 3 after all!). At some points, these massive birds flew so close overhead that it felt as though we could reach out and touch them. To think that barely 30 years ago, the condors in Peru were on the verge of disappearing all-together. Today it was like all the Condors Peru had on hand were coming out to say hi. 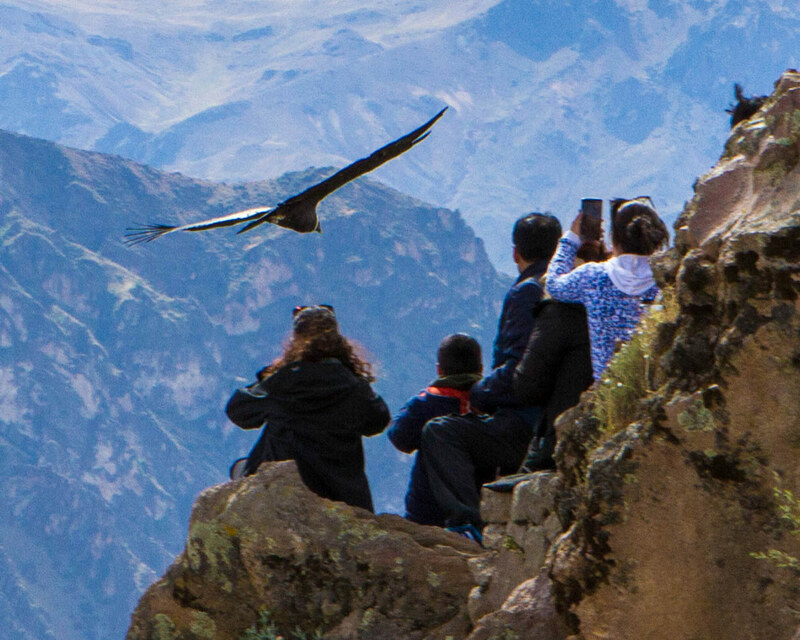 We spent well over an hour watching the Andean Condors fly through Colca Canyon. Our trip to Colca Peru was definitely worth the visit. As all the Peruvian condor finally slowed their appearances, we regretfully made our way back to the van. But our next adventure, driving to Arequipa from Colca Canyon would be amazing as well! How Can I Help Animal Conservation Efforts? Wow! Beautiful images guys. My wife visited Colca Canyon a while back. She had pictures of the condors in the distance along with a few shots with locals. I recall her dressing super warm too; things get chilly a few miles high into the atmosphere 😉 I dream of seeing these majestic, huge birds one day.